As I mentioned in my review of Taqueria La Guadalupana, Manchester is definitely on the upswing when it comes to Mexican food, with all sorts of good places opening up over the last few years. One of the more recent, and more delicious, ones is El Rincon Zacatecano. Located across the street from Verizon Wireless Arena, El Rincon is in a somewhat subtle storefront that used to hold several other businesses (the last two I remember were Dave’s Cosmic Subs and Hollywood Subs, and I know there were several before that). With that many turnovers, it’s one of those locations that I’m tempted to label a “cursed location”, but El Rincon has been there well over a year now, and it seems to be doing well. Walking inside, this isn’t like a lot of the other Mexican places that have sprung up recently, that look like a hastily converted space for someone’s taco truck. 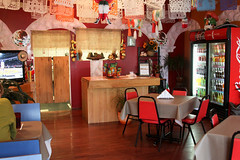 Nope, El Rincon is nicely decorated, with nice, clean booths and tables, some decorations that are more “Mexican Pride” than “Mexican Tacky”, and a nice ordering counter. Settling into a booth, we were quickly greeted by a server who gave us menus and very excitedly described what she thought were the best dishes. Well, they’ve got a much deeper menu than most of the other taquerias in town. In addition to having the standard tacos with a variety of meats (pastor, asada, pollo, lengua, and the like), they also have burritos, flautas, and the like. 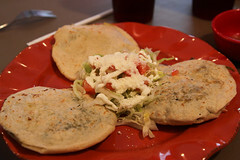 Most importantly, I noticed they had fresh gorditas, made with your choice of cactus, pepper, or chicaronne. Well, with choices like that, how could I go wrong? Carol ended up with a trio of tacos, and I ended up with one each of the cactus, pepper, and chicaronne gorditas. And a pair of Jamaicas to wash it all down. After a short period munching on some tortilla chips (where were nicely baked instead of fried) and some homemade salsa, our food arrived. Well, in short, it was good. Carol’s tacos were a nice trio of street-style tacos: nice meat, freshly warmed tortilla, and some fresh onion, cilantro, and salsa. Everything you want from a good taco. The gorditas? 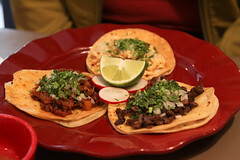 They were even better: nice little patties of soft masa, perfectly crisped and cooked. All three filling were tender and flavorful, especially the chicaronnes which were simmered in a delicious red sauce. Really, these were what I really look for in good Mexican food: freshly made, nicely sauced, and having the texture that only recently made masa can have. I’ll definitely get these again. Overall, quite the good find. 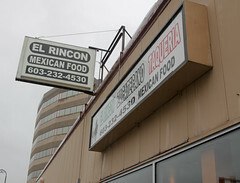 El Rincon is easily accessible (just off of Elm), nicely run, and is kicking out some seriously good (and affordably priced) Mexican food. I sure hope they’ve broken the curse of their predecessors.